Rich Pins has been introduced by Pinterest. Here are the easy ways how you can use for WordPress to validate your rich pins and apply to get them on Pinterest. If you are new to our website, clearly know – we hugely dislike to use lot of Plugins – unless it is mandatory to use, like Akismet is almost a must, we do not recommend to add some new plugins or some SEO plugins. WordPress is coded in a way, if you have some kind of same plugin, without really knowing many things about PHP, you can actually edit the plugin a bit and get more features. First read our previous article – Showing Open Graph Protocol og image, og description Properly. As you can see, lot of things are written there in the old post. Practically, if you apply them, you can validate your rich pins and apply to get them on Pinterest. So is this guide Rich Pins Pinterest for WordPress is the old wine in new bottle? Not really. Please note that, in this article Rich Pins Pinterest for WordPress, we can only tell you how to get validated, we can not give any warranty whether pinterest will actually pass your application – we do not know that way how they approves. Its not Facebook, Twitter or Google Plus where in all cases we can give warranty. We also have applied for. We have quite huge number of re-Pins, Favs for certain articles like this post has 2K+ re-Pins – its naturally obtained, not from some paid service. We are mentioning this point because an internet marketer might think in wrong way – they will try to ‘invest’ to get more re-pins, favs etc. Thats not the point – we want to clearly say – making technically right is not only the way to get approved, at least for now. You’ll understand that, this is an issue for some users. So far, for Twitter-Facebook-Google Plus battle, we had no such issue, because we never needed the pricing part, Author part, date updated etcetera parts in Open Graph Protocol. Flaw is that – Pinterest show throw two options to select – which one? We found two ways to fetch data from your website – Schema.org markups and Open Graph Protocol. 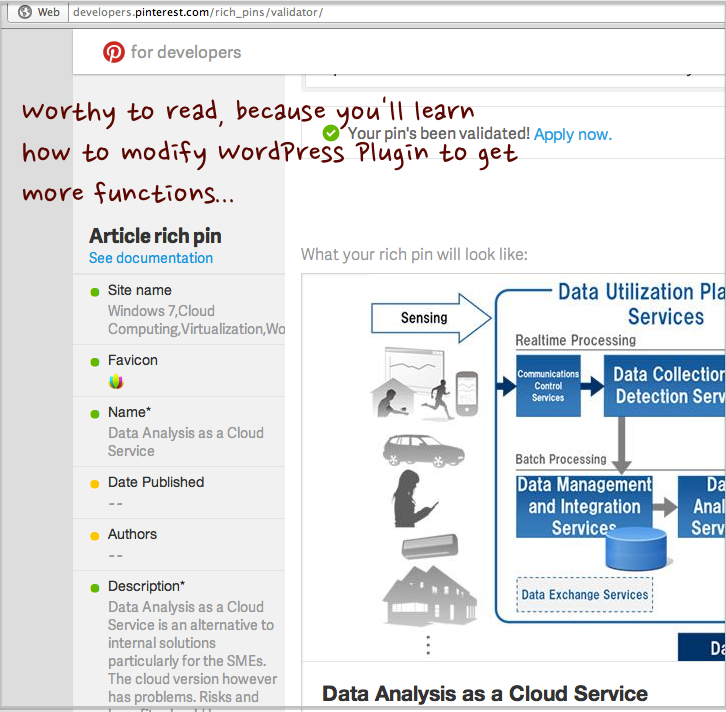 So, this Rich Pins Pinterest for WordPress guide is not old wine in new bottle. // existing description before moving onto the fallbacks. Then $ sign, echo – these are for printing the things in your head. Not your head, your webpage’s header ! The star, double slashes are to escape computer’s eyes – we say they are commented out – these parts are for human understanding. So, frankly you’ll copy one function, paste on any text editor, change the commented out line (Like Parses the output for the date published…) and add echo function. Obviously, simple copy pasting will not work, for date, if ( empty( $wpfbogp_images ) && ! $fallback ) will not work, you copied from getting image block of codes. Change to your own need. That is partially from WordPress codex. But what will happen if you need a function that is not present in WordPress but a Plugin? Like you need the pricing one? You need the source code and documentation of that Plugin. You have to to call that function. Unfortunately, there are paid WordPress Plugins which practically do not write comments in the way we have shown or neither have good documents. They do it to ”circumvent’ the Free GNU GPL way and to charge some money. You need to find the functions by checking all the files line by line. Its quite difficult. If you still need help, ask in WordPress Forum. If you want to get help, there are many people who will help you without any reason. Update on 8th October, 2013 : Pinterest ultimately accepted our request. Rich Pins on Pinterest is active for this website. There was no official notification, we saw the desired changes on 29th of October. This Article Has Been Shared 6667 Times! Cite this article as: Abhishek Ghosh, "Rich Pins Pinterest for WordPress : Easy Tips & Tricks," in The Customize Windows, September 27, 2013, April 21, 2019, https://thecustomizewindows.com/2013/09/rich-pins-pinterest-for-wordpress-easy-tips-tricks/.